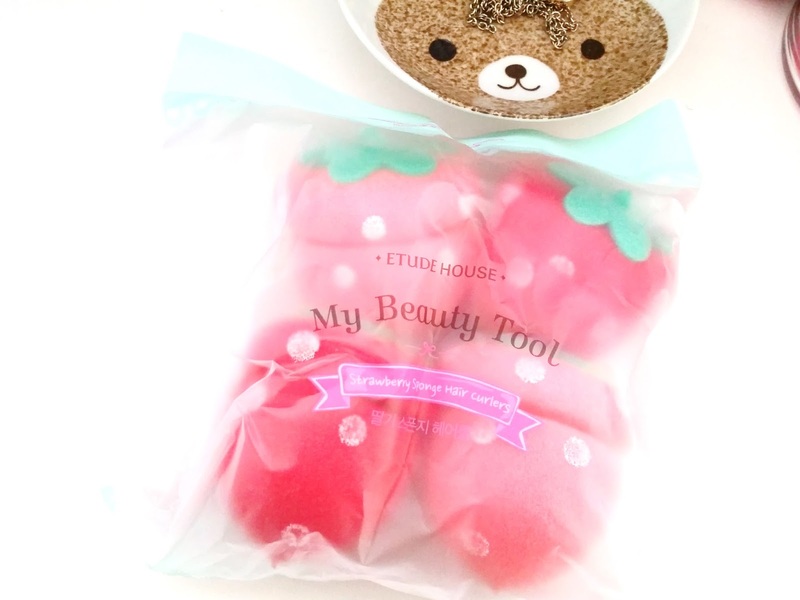 Easy No Heat Curls With the Etude House Strawberries! Who here likes strawberries? I know I do!! Who's too lazy to curl their hair every morning? I know I am! Hahaha. I think I really only grab my curling wand for those special occasions or the kind of days when I have extra time. On other days, I'm all about the lazy ways to curl my hair because let's be honest, I'd rather sleep (or do my morning skin care routine) or whatever else, than to spend forever curling my hair (and possibly burning myself with the curling wand). There are a ton of tutorials to curl hair without the heat on the internet, from braiding the hair, to a twisty bun (my go-to), to overnight clips and sponge rollers. I've tried all except the sponge rollers. That is until now. These are the Etude House My Beauty Tool Strawberry Sponge Hair Curlers (what a long name) I got courtesy of Memebox. I was squeeing on the inside when I saw these. I mean, just look at them, so adorable! Cuteness level 1000! Usability level? Let's find out. 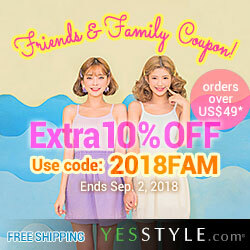 Product Description: Easy to use sponge curlers that can curl hair without the need of heat, so no heat damage. These hair rollers can create bouncey curls or soft beachy waves easily. To Use: Divide the hair into several sections. Roll each section onto the hair curlers and secure the ends by inserting it into the groves. Twist the strawberry hair rollers to keep it in place. Leave it in for an hour (or several hours, or over night). Remove the sponges and run your fingers lightly through the hair. Tip: best to be used with damp hair. Packaging: The sponge curlers comes in a pretty simple looking see through bag. It's got simple Etude House signature designs on the front and information about the sponges on the back. While most of the information are in Korean, the directions and cautions are in English and Korean. Texture: The sponge curlers are super soft sponge like. The white spots on the strawberries are painted on. They might come off over time. Color: The rollers comes in both red and pink with the green leaf tops. My Thoughts: As you can see, I have pretty long hair. I actually got a cut at the beginning of summer, but it just grows so fast. I think I might have to get a cut again soon. My hair is actually on the thin side. Not super thin though. I also have quite a lot of hair, although because it's thin it doesn't seem like it all the times. Anyways, since I've only got 4 curlers, I didn't have enough for all of my hair. So, I ended up using all four for half of my hair. So in the pictures below you'll see the curlers in half of my hair and also how my hair looks like afterwards. I'm going to have to buy more curlers if I want enough for all of my hair. Before I put the curlers into half of my hair, I applied my favorite hair serum. My hair holds better when it's got a bit of oil/serum in it. Plus, it was also pretty damp when I applied the rollers as I find it works better with damp hair. I actually had a couple of trial and errors before getting it the way I want it to look. I think it will take a couple of times to play around with the curlers and test the looks before deciding what's best for you. 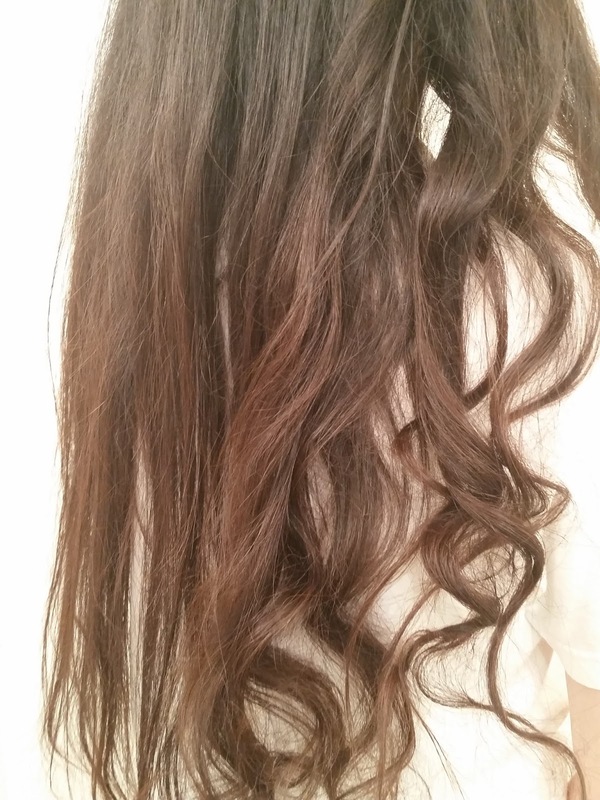 I personally like loose, beachy curls, so it was seemingly easy to create. There are two ways to roll the hair onto the curlers. Either from the top of the hair and roll the ends in or from the ends and roll to the top. I've tried both ways and I find that I like the second method better. It's a little messier that way, but for loose, beachy curls, it actually looks really good. It also makes the ends look more natural that way. After that, I just follow the instructions and secure the ends in place by tugging them into the groves. As you can see in the picture above, a section of my hair is rolled onto the strawberry sponge curler. I think it's a lot easier to roll the ends in last than to roll it in first. However, I like the look it creates when I roll the ends in first. What I found works best for me is to twist each section a bit before rolling them onto the curlers. This will help keep the hair in each section and minimize flyaways. I usually do this first thing in the morning and keep the curlers in my hair for over an hour or so while I get ready. I have tried it for longer periods of time and even overnight. I have to say that I couldn't get use to them for the overnight uses. I ended up taking them off and went to sleep. I did try the curlers for 6 hours. It felt like a really long 6 hours because I am always reminded of the curlers in my hair. While they are adorable, they can be a bit annoying at times, especially when I moved around and stuff. 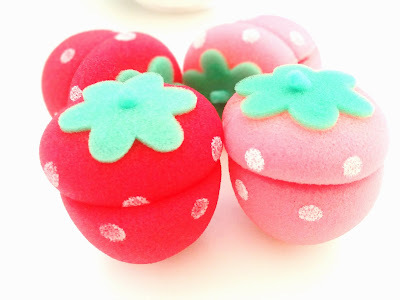 I think, if you can get used to having strawberry looking sponges in your hair, that moves and bounces when you move, then these would be perfect for no heat curls. For me, one hour is enough to create that beachy look. (It's a short enough time to use the strawberries without getting annoyed that they bounce/move with every single movement.) I just spray my hair afterwards to keep it in place and it'll be good for the day. The usability is definitely here. I'd say usability level is 1000! A perfect match for the cuteness level. 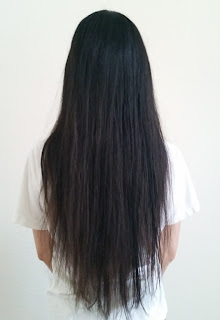 You can see how my hair looks like below after 1 hour. The left side wasn't curled and the right side was. 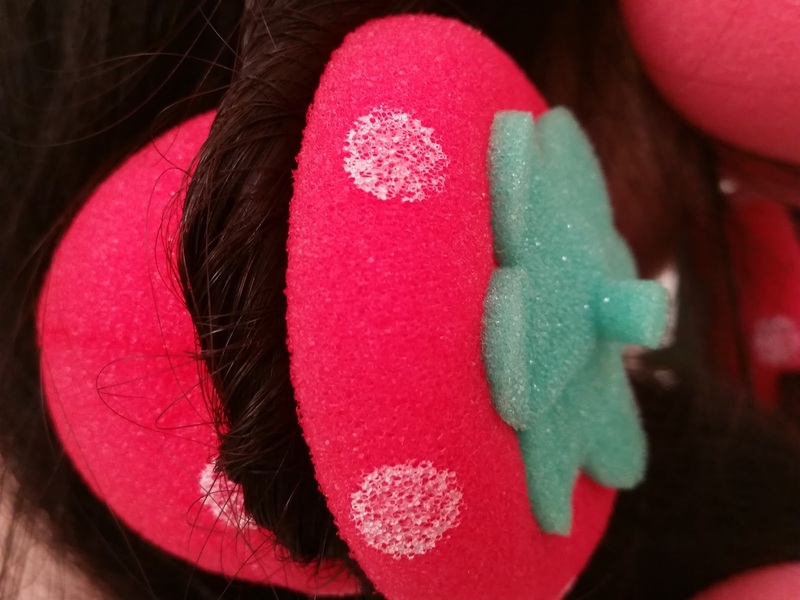 My Thoughts: I really adore these cute Strawberry hair curlers. They are super easy to use and does the job without the heat. Plus, they are super inexpensive as well. I know I'll have to buy another bag of these since I have really long hair and one bag of 4 is not enough. Will I purchase more of these curlers in the future? Yup! I need enough for all of my hair. 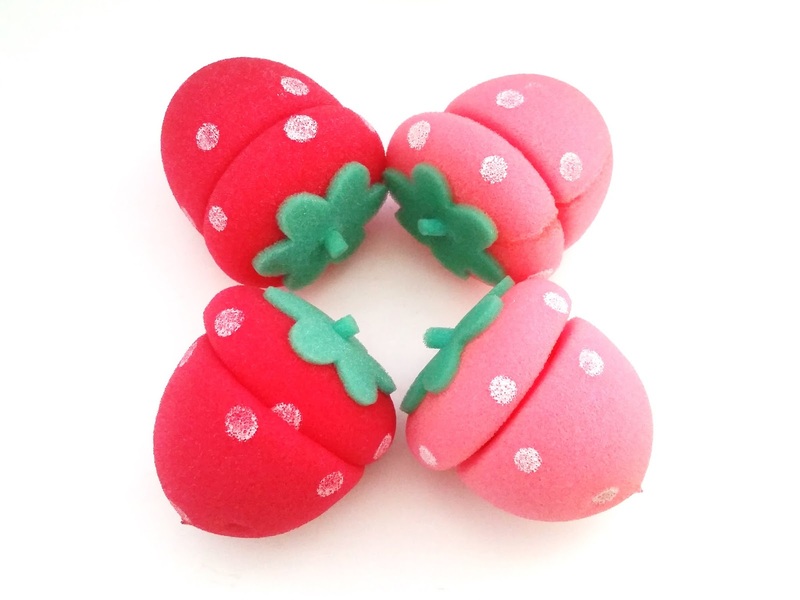 Do I think these Etude House Strawberry Sponge Hair curlers are worth a try? Double yup! If you like adorable things and are looking for a easy, no heat way to curl hair, then these strawberry cuties are definitely the way to go. 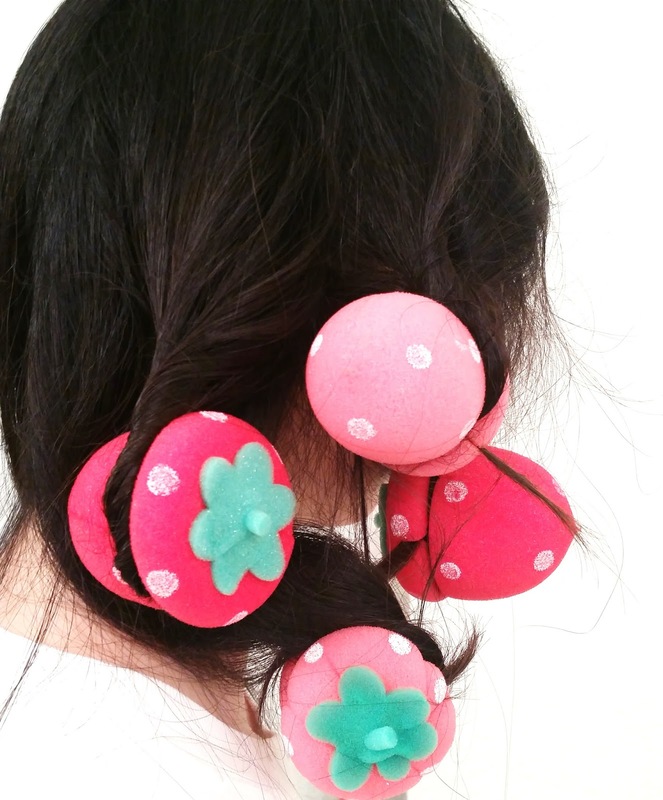 Have you tried sponge hair curlers? Do you like them?